This page attempts to record what is known about the origin and history of Paper Spills. Please contact me if you know any of this information is incorrect or if you have any other information that should be added. Thank you. Spills are used to carry flame from a fire in order to light the wicks of candles or oil lamps. Prior to the easy availability of cheap matches this would have been the main way in which candles or oil lamps were lit. From perhaps the 15C onwards spills were often kept handy in spill vases which stood on the mantlepiece of any room in which a fire was commonly kept lit. I have found one intriguing reference, from antiqueanswerman.blogspot.com/2008/11/spill-holder.html, to the effect that 'From 1700-1870 spill holders were made of wood, iron, earthenware, glass, and even fancy folded wall paper', but unfortunately no evidence to back it up. Paper spills could be simple twists of paper or more complex fold and cut designs. 'The Girl's Own Book' by Lydia Marie Child, which was published by Clark Austin and Co in New York in 1833, contains a section titled 'Alumets', presumably a misspelling of allumettes, which is French for matches. 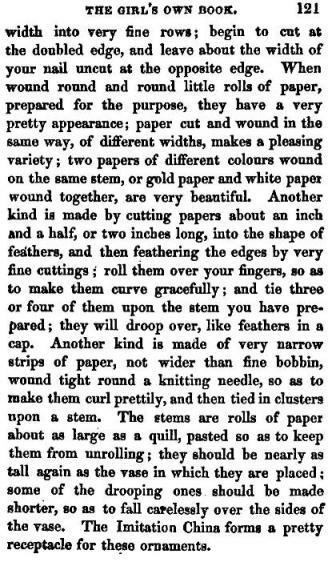 Although the opening sentence claims that 'These ornamental papers are principally for show' it is clear from the following words 'although the avowed purpose is to light cigars, lamps, &c' they are in fact paper spills made by folding and cutting strips of paper. 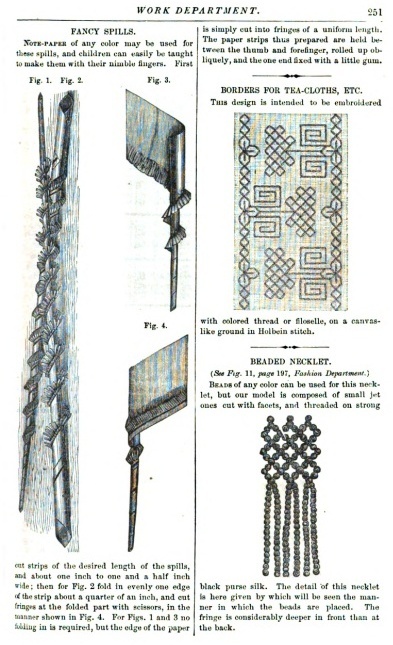 Volume 96 (January to June 1878) of Godey's Lady Book, an American publication, contains a section on making 'fancy spills' of a similar design. 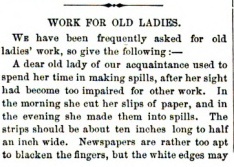 Volume 97 (July to December 1878) of the same publication contained a section titled 'Work for Old Ladies' which gave basic instructions for making paper spills.